A smaller sized semi-acoustic guitar, falling somewhere between the dimensions of a Les Paul solid body and a 'Dot' semi. Its construction is best described as being a heavily chambered mahogany body (so no centre block of wood) with, I believe, a laminated ply top which is finished with a flamed maple veneer. The neck is set in and is made of maple. It features two Epiphone Alnico V P90 pickups; a 3-way toggle switch; and volume, volume, tone, master volume control pots. I bought this guitar around 2009 from Imuso. I purchased it by mail order as a brand new instrument and was pleasantly surprised when it turned out to be an '06 Unsung model. Its condition indicated to me that it had not been played/displayed. The fit was immaculate and the finish excellent, bar a slight thinness of the stain in one very small part of the neck. I will say that the poly finish on the guitar is a little too thick which makes the top look a little bit plasticky on close inspection. However, there is no doubt that its distinctive and compact shape, flame top and bigsby make the Wildkat look very very cool indeed. Playability wise the guitar arrived with a surprisingly low, buzz-free action and it was very well set up out of the box, just requiring a tune up (although a new set of strings were in order.) The fingerboard is a very nice piece of rosewood, without any 'artificial' type look and it feels very nice to the fingertips. Being a solid body guy, I'm always very surprised at how playable the neck on this guitar is. I like my fair share of rock and metal and, with the Wildkat, you can still fly around the fret board and bend strings with ease. However, the overall style and feel of the guitar invites you to play it in a different way. I find myself enjoying arpeggios and slower pentatonic and blues solos more with this guitar. Tuning stability is very good, although I initially had the usual angled-back neck problem of string binding on the G and B strings. This has played itself out with use; secondary to an application of pencil graphite in the nut slots. Having never used either a semi-acoustic, P90 pickups or this type of control layout before it took me time to 'find' the guitar. Take it from me however that, when you do, you will discover how versatile the Wildkat really is. For a great punk tone the bridge pickup delivers that typical P90 growl and grit when you throw some medium gain and/or pick attack at it. Furthermore, there is none of the muddiness which is often associated with humbuckers. The neck pickup, on clean settings, offers superb articulation and clarity; giving that nice archtop/P90 'jangle' as opposed to your typical tele/strat 'quack'. I find this tone to be even nicer when you add in time or modulation-based effects. For example, the neck pup sounds great clean through my solid state Peavey Backstage 50 with a touch of its onboard reverb. Equally nice is the clean tone through my Peavey 5W Valve King with analogue 'slap back' echo and/or subtle chorus added. Clean neck pup settings make the 'Kat ideal for brit pop, jazz, country or indie genres. Turn up the gain and the neck pup gives you some great, gritty blues tones. For more of a rock or hard rock tone I like to use the middle toggle position with the bridge volume cranked up to 10 and the neck volume set at the 3 position. To me it gives a sort of 'humbuckerish' tone, although I'm not sure if the middle position is truly humbucked. Perhaps somebody else can clarify that one for me. In a playing situation, if you like to set your desired tone using a middle position blend, you can still control your overall volume and tone with the master pots. Alternatively, you could set individual volumes for both pickups and use your toggle switch to alternate between rhythm and solo parts while still having your master controls for tweaks. 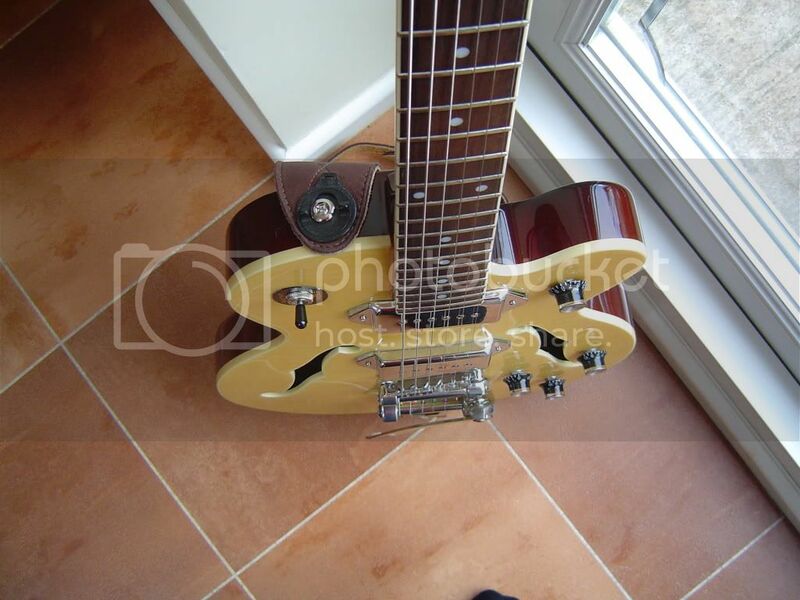 Edit: Forgot to say that the neck pickup on a clean setting with some slap back echo added gives you an instant rock'n'roll/rockabilly tone which also works very well for tracks such as the Pulp Fiction or James Bond theme tunes. This guitar has a very solid feel and I've had no major problems with its construction or hardware in the two plus years that I've owned it. However, I have experienced some mechanical buzzing from rattling internal wires which I believe is common with semi-acoustic guitars. If and when it occurs, this is readily sorted out with a bit of prodding and pinching through the F-holes. Also, the other week, I did experience some temporary cutting out of the neck pickup when I selected it with the toggle so I guess that I might need to replace it with a switchcraft version at some point. Hopefully this is an external, rather than internal, job. I think you can get a special tool to allow you to unscrew it without damaging the top. Hopefully somebody will confirm that I could just pull the old switch and wires through their hole and solder a new one in place externally. Being a semi-acoustic, upgrading electronics would be much more fiddly and time consuming than it would be on a solid body guitar with its rear access plates. However, unlike Epi's stock humbuckers, their P90s don't seem to suffer from muddiness problems so there is not really any need to replace them. Tuner-wise, the Grovers are very stable and functional with a good turning ratio which makes fine tuning very easy. I know some people like to install roller bridges and locking tuners with their Bigsby equipped guitars but I don't really use the trem often enough, or aggressively enough, to cause myself tuning problems. 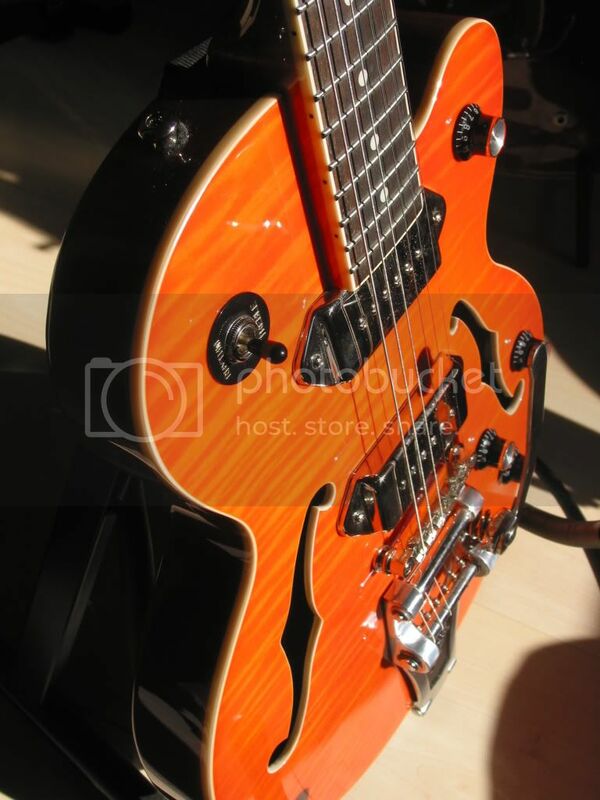 Overall, the Wildkat is a very much a head turner and it's an original Epiphone design to boot. The guitar is very easy on the fingers, playing with a fast low action if required. With its unique control options it would make a great gigging guitar for any rock, rockabilly, blues, punk, indie, pop, jazz or country player. To sound its best on clean settings simply add in a spot of reverb, delay and/or chorus depending on what suits the music. If you want grit and growl, just crank things up. WOW!!! That is one of the most beautiful guitars I've ever laid my eyes on. I've parted ways with many a good guitar over the years, but that is one that I would never part with . . . so how much do you want for it anyway? Just kidding. Super review. Don't forget about Lounge "DIY" Thread! Your review has just served it's purpose for ME!!! 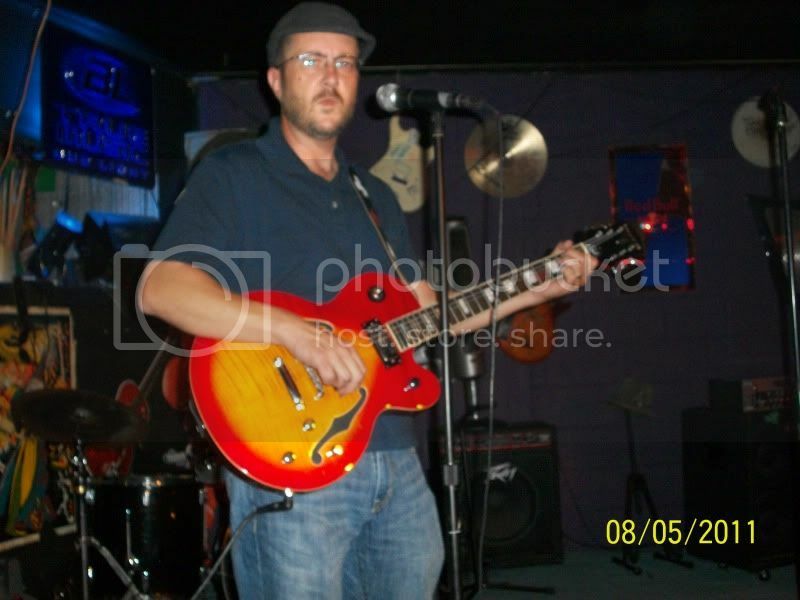 of a Les Paul solid body and a 'Dot' semi." Every time there's a thread about Wild, or Alley Kats, I get a bad case of GAS. I played one at one of our local stores and had a really hard time to put it down, and not walk out with it. And you're right Greg. It is, at least to me, a great size for a semi hollow. Terrific review Alan, very thorough, and that's a lovely Kat you have there too, thanks for sharing your opinions. Definitely the best of both worlds with the Wildkat....Solidbody playability with hollowbody tonal characteristics.....throw in a couple p90's and it's rock-a-billy heaven! Great review! Also, the other week, I did experience some temporary cutting out of the neck pickup when I selected it with the toggle so I guess that I might need to replace it with a switchcraft version at some point. Hopefully this is an external, rather than internal, job. I think you can get a special tool to allow you to unscrew it without damaging the top. Hopefully somebody will confirm that I could just pull the old switch and wires through their hole and solder a new one in place externally. Yes sir, that can be done, and you don't need a special tool, just a pair of pliers and a good dose of caution so as not to scratch the poly. Mine's an '07 Unsung in the lovely sunrise orange; I've posted pics of it here too many times to count, if anyone wants to see it just do a search for Wildkat and I'm sure you'll find it easy enough! When I got mine it suffered from the usual "P-90 buzz", but then I got a whole new wiring harness - pots, switch, braided wires - and did it all myself. NO prior experience! Going through the f-hole is a heck of a way to pop one's guitar modding cherry, let me tell you! Anyway, after that, the buzz.... *gone*! I don't know if I did something wrong, 'cause, well, single coils are supposed to be noisy, but they're pretty darned quiet now! I also threw on some knurled chrome knobs, lost the poker chip, and had a bone nut installed with a full set-up. Thinking next year maybe getting a roller bridge, or maybe one of those Wilkinson compensated saddles. I love this guitar. I love the neck, I love the weight, I love the TONE! Sure there are some minor tuning issues, but after the new nut (my tech also replaced the bridge with one that was "more stable" for $25), it's much better. Back to the tone. Crisp chimey cleans, and gritty crunchy growl; never muddy, always clear and just there, kind of "above it all" if you know what I mean. I rarely bother trying to find any other mixes with the pups (even though they're there), 'cause these two tonal options alone make this guitar the shiznits. If anyone is lusting after one of these, get your guitar shop to bring one in so you can try it out. If you don't like the bigger size of a Dot, the Wildkat might be right for you. You may also consider the Epiphone ES-339 once it is available. That one has the classic ES-335 look and pickups, at a smaller body size. 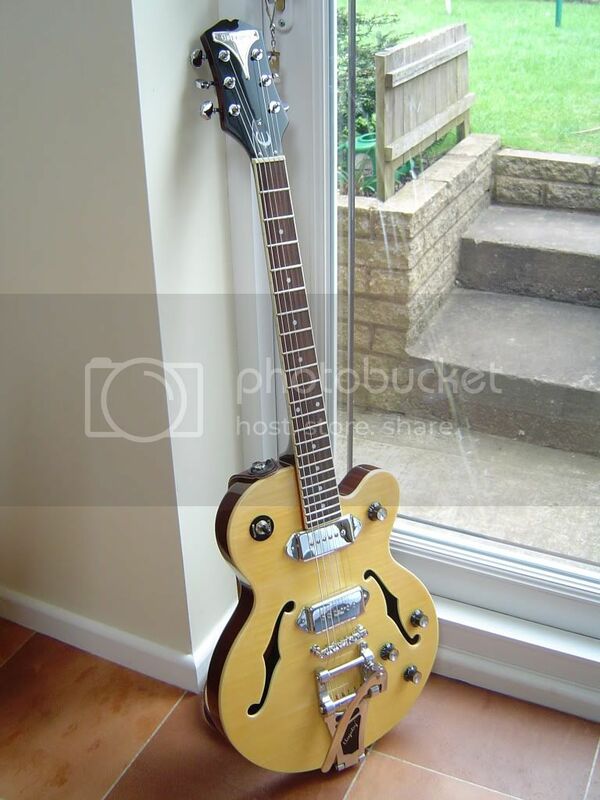 Another hot suggestion (but non-Epiphone, and somewhat pricey) is the Duesenberg Starplayer TV. 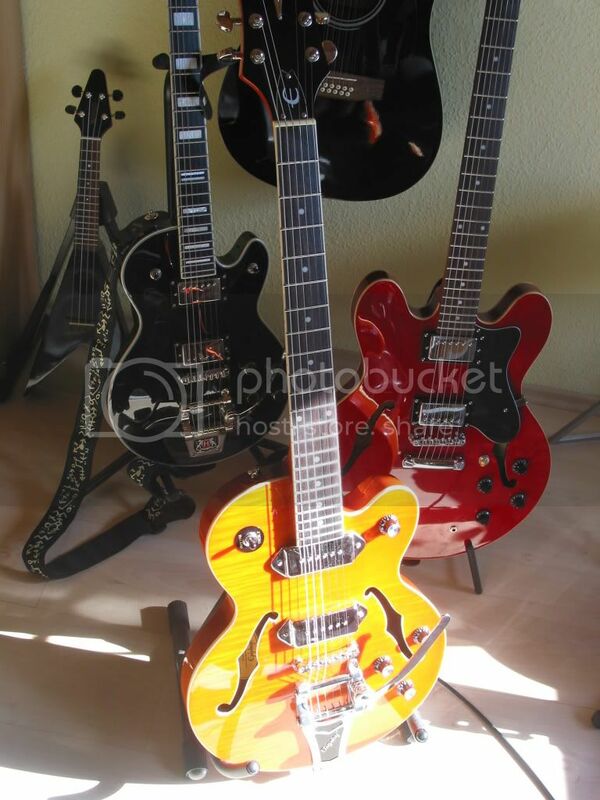 That one is semi-hollow, slightly bigger than a Les Paul, and a dream of a guitar. Great review, and a great guitar. I got my Wildkat a couple of months ago and just can't seem to put it down. MF and GC have bumped their price to $499 but Sweetwater (where I got mine) still has them listed at $399 (although not in stock right now). I special ordered the Trans Orange and just love it! Where did you get your "new wiring harness". My Wildkat just lost its switch, so I would like to "upgrade" the rest of the controls at the same time. But don't know what the Pots values are, or if Linear taper or Audio taper or whatever. Any info at all would be so helpful to me. Of course, with the humbuckers, it's a different animal. Mine has been gutted electronically (a few times) in an effort to eliminate muddiness. Have had a tough time finding a bridge pickup that sounds good, but I'm fairly pleased with the 498 I'm currently using. Have a Duncan SM3 in the neck. The electronics, I've whittled down to the three way (now switchcraft) and a single volume and tone, done up with braided. Pushback wire. That helped a lot, right there. The body on mine has developed a little warp to it, but it doesn't seem to affect the playability any. The nut was cut pretty poorly. Despite those drawbacks, it has turned in to a good player and I doubt it goes anywhere. My Gibson LP still sounds better, but this one is pretty good. I'd give a 6.5 out of 10 overall. Maybe 7.5 with the changes I've made. I went through Jonesy at ToneMojo (http://jonesyblues.com/). He asked me for some measurements between switch, knobs, jack, and such, as he'd never done a WildKat harness before, and it fit real nice. He'll probably remember doing the kit; I asked for a .033 PIO cap, which he installed, but he also threw in a bonus .022 if I ever decide to get dirty and change it out. Drop him an email, he's a stand-up guy and great to deal with. Maybe a bit pricey, but I thought it was worth it. You will need to get new knobs, though, as the stock shafts are metric and Jonesy uses CTS (US gauge) pots. You'll also need to bore out the holes a touch; just wrap some sandpaper around a pencil shaft and do it manually. It only took me about 5 minutes per hole, real simple. And brush up on your soldering before the kit arrives! Great review of a truly magnificent guitar. And the price! Please allow me to play the devil here and ask you to imagine the ecstasy of some Lollars or Fralins in that bad boy. I've been a bit more generous then! I got my Wildkat in may this year and I´m very happy with it. The sound is awesome and it´s my best looking guitar. I ordered it in England to get it a little bit cheaper than here, although it hard to find a sunrise orange one. actually available in???? I'm thinking about a "MAYBE Purchase"? I got my Wildkat in may this year and I´m very happy with it. The sound is awful and it´s my best looking guitar. I ordered it in England to get it a little bit cheaper than here, although it hard to find a sunrise orange one. You're obviously very easy to please, Hippy! Great review of a clearly terrific guitar. So far I've been able to resist the call of these "mini-semis", but if I ever stumble across one of those discontinued Flamekats, I'm afraid I'm going to be in trouble! I LOVE that bling!! !